Last night I had the pleasure of being the guest speaker at Woollahra Council’s citizenship ceremony where we were treated with those great Aussie classics, lamingtons and pies. 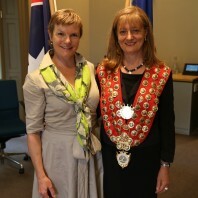 Mayor Toni Zeltzer, who taught me Biology at school, wore her ceremonial chains and gave each new citizen a native plant as a memento of the momentous occasion. I took the opportunity to speak about my long history in the area and how I came to be involved in activism to protect our built and natural heritage. I also asked the new citizens to help us protect our land and water from unchecked coal and gas development. Thanks for this opportunity to speak to you this evening, here at Woollahra Council on the traditional land of the Cadigal people of the Eora nation. The Eora nation stretches right up to the Hawkesbury River in the north around Palm Beach, way out to the Nepean River at the foothills of the Blue Mountains in the west, and south to the Georges River just beyond Botany Bay where Captain Cook first landed and claimed Australia as an English colony. I often like to imagine what Sydney would’ve looked like back then. It would’ve been a paradise I reckon, with eucalypt forests covering all the headlands and crystal clear waterways. It’s a very different place today that’s for sure. Woollahra takes its name from an Aboriginal word but there are differing opinions on what that word actually meant – was it ‘meeting place’, or ‘sitting down place’, or ‘camp’ or ‘look out’? All of them seem to suit because this is undoubtedly special land, prime real estate. I moved into Queen St. Woollahra when I was about 7 and grew up here. 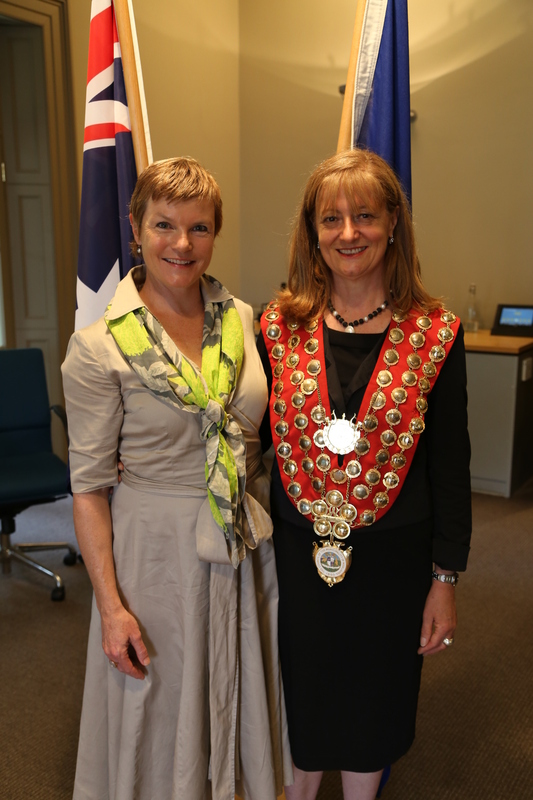 I used to come to the library next door, and I went to Woollahra Public School and then later to Ascham School where I was taught by the very woman who would become Mayor of this great local area – Toni Zeltzer. Toni has asked me to talk to you about what being Australian means to me and what I believe this wonderful place offers. So let me tell you a bit about my background and the sort of opportunities that I’ve had here. I’m a fifth generation Australian, possibly sixth generation but it gets a bit murky back there in the archives. My parents were both born here but they left Sydney in the early 60s because it was a cultural desert. There was no arts scene to speak of. There was not much theatre being produced and what was on offer was pretty conservative. And since they were both very creative people, there just wasn’t the sort of cultural life to sustain them. So I was born in London in the swinging 60s. Two years later, my parents saw an exhibition of Australian art and got so homesick that they decided to return. At least, that’s the story. We moved into Woollahra in 1970, when it was still very much a working class suburb and Queen Street was a regular old suburban street with milk bars, and newsagencies and butcher shops that were about as far removed from today’s glamorous Churchill’s butcher shop as you could possibly imagine. I often think of Queen Street as my songline because it holds so many memories for me. We lived in two houses there – initially at number 46 where my Mum first had her antique jewellery shop (she still has her shop there, at number 36 today), and then we lived at number 117, a fabulous old Federation House called St Kevins, which my father restored from what was essentially an old dump. My Dad loved old houses and was very active in the local community. He started the Queen Street Fair, which became one of Sydney’s annual highlights. And he organised a local action group called the Queen St and West Woollahra Association to protect historic houses of the area, many of which were under threat from plans to build a freeway right through the guts of the suburb. I went to my first demonstration aged about 8 or 9 to try and stop the demolition of Waimea House, a fabulous old Georgian House just off Queen Street where the Hellen Keller Hostel used to be. I remember making a sign that read ‘Bury the Bulldozer’ which I thought was very clever. So, thanks to my Dad, I was made aware of the value of our built heritage from a very young age. Compared to other countries, we don’t have a lot of really old buildings here in Australia. Our oldest building is Elizabeth Farm out in Parramatta, which dates back to 1793, just 220 years old. In France there are buildings that date back to 4850 BC. But Australia does have the oldest continuous living culture on the planet. It’s a remarkable fact that indigenous people have been living on this ancient continent for over 50,000 years, and for this alone they deserve our deepest respect. But unfortunately many of our Aboriginal brothers and sisters are living in third world conditions by today’s standards, and this is something that I believe we as a nation need to address as a matter of urgency. It’s a shameful state of affairs. I’ve travelled all over this incredible country for my former work as an arts journalist and travel writer, and purely for pleasure – from the Kimberly, to Tassie, to far North Queensland, to Uluru and Kata Tjuta – and I’ve developed a real passion for the Land of Oz. It’s so harsh, and yet so subtle, a place of real contradictions – the giant gum trees, the delicate wattle, the rugged rocks of the outback, and the remarkable wildlife! I mean, what other country can lay claim to having the only two mammals that also lay eggs? The echidna and the platypus are unique freaks of nature, and we are privileged to share this land with them. We have absolutely priceless natural heritage like the Great Barrier Reef. We have access to world renowned beaches like Bondi where we can learn to surf as I did as a kid, and experience the feeling of being truly free. We’re so lucky to know that feeling of freedom and sometimes we take it for granted. In many other countries, this sort of freedom isn’t a birthright as it is for us here. We have so much wild space but ironically, we also have limited resources, and by that I don’t mean mineral resources because we have lots of those, but the absolute essentials like water and arable land where we can grow food. Australia is the driest inhabited continent on Earth and despite our immense size, only 6% of it is fertile enough to grow crops. Unfortunately, a lot of this precious land and water resource is currently under threat from checked coal and gas mining. It’s a really big problem, especially in NSW. Even here in Sydney, the water catchment is being threatened by unconventional gas extraction through processes like the controversial hydrolic fracturing of rock strata known as ‘fracking’. There are, of course, innovative alternatives being developed that could supply all our energy demands without jeopardising our land and water – things like smart solar, wind and wave power generators. And what other country has as much access to the sun, wind and waves as ours? If we want to live up to our reputation as the ‘Lucky Country’, and be good custodians of this amazing country that we’ve inherited, we’ve really got to push for these clean energy initiatives to become a reality. So I congratulate you all on your new status as Australian citizens, and hope that you realise all your dreams and desires here, and that you’ll help us to protect our land and water for the sake of our kids and grandkids and all future generations of Australians.